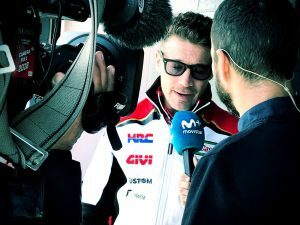 Following LCR Honda CASTROL rider Cal Crutchlow’s injury at Phillip Island, the LCR Honda Team has confirmed that HRC Test rider Stefan Bradl will replace the Briton at the Sepang Grand Prix. Crutchlow – who headed to Australia in great form after his second place at Motegi – suffered a fracture to his right ankle and distal tibia after a heavy fall at the famous coastal circuit on Friday and won’t be able to participate to the Malaysian GP next week. “Obviously we are very disappointed about Cal’s crash in Friday’s FP2 session and the resulting fracture of the right ankle. But this is part of racing and we must accept if even if we do not like it. Cal’s orthopaedic problem will be successfully fixed in few weeks. The whole team wish him a very speed recovery and in the meantime we move to Malaysia for the penultimate round of the season with another LCR former racer. Stefan Bradl raced in LCR colours for three years in the premier class (2012, 2013 and 2014) and we know all about his remarkable skills and undeniable talent. We are happy to be back in the garage together”.